The Foundation reflects the social and humanitarian values of Swiss Re. We partner with social entrepreneurs, aid organisations, researchers and Swiss Re employees and clients to help communities increase their resilience. On a Community Day in Switzerland, Swiss Re volunteers and a refugee tune up a used bike for shipment to a needy community in Madagascar. 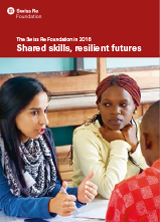 This report presents the Swiss Re Foundation’s approach, a focus section on employee engagement, its awards and an overview of its programmes.